Surviving a natural disaster can be done, but a great deal depends on who is involved, what happens, when it occurs, and where the situation takes place. Natural disasters occur, or so it seems, when you are least prepared, which makes the emotional impact of the situation more severe. Even when warned well in advance, many do not heed warnings and attempt to ride the situation out, often dying in the process. Surviving a natural disaster takes a great deal of luck and it always takes preparation. We should plan for natural disasters well in advance. Nonetheless, I am not suggesting we get paranoid, but simply prepare for emergencies, because in any survival situation, the key factor is being prepared. Natural disasters may involve two types of survival, the initial emergency as well as the prolonged survival situation. As seen in Japan recently, if you survive the initial situation it doesn't necessarily mean you have an easy road ahead. It may, and often is, days or weeks before supplies, safe drinking water, or medical assistance arrives on scene. In the mean time, survivors attempt to keep on living best they can. If you have equipment ready and your mind prepared, your chances of surviving a crisis increases greatly. Additionally, those prepared are usually more psychologically and physically comfortable due to stored necessities and knowledge. I believe most weather forecasters and disaster response teams will tell us it is only a matter of time before we have more disasters, but the type of disaster will vary depending on your geographical location. Security professionals know it's just a matter of time before terrorists strike again, so doesn't being prepared just make sense? This book covers most major disasters and how to stay safe if you decide to evacuate or stay. It has a section on prolong survival, which will assist keeping you alive after the natural disaster has done its damage. Many people die following natural disaters, from one mishap or another, but you can learn to survive. 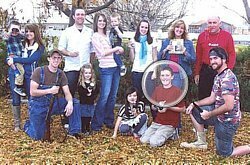 In August of 2011 our family was blessed and relieved by an experience that made us appreciate being prepared, and of having a strong family. It was probably the scariest and most nerve racking experience of our lives. Our youngest child, Jared who was twelve, was camping with his scout troop in the Uintah Mountains. The troop was fishing and Jared lost a lure to one of the fish. He asked around to see if anyone else had a lure he could borrow. No one did, so he decided to go back to camp and get one. The mountains are covered with dense trees and everything looked the same to our young scout. He mistakenly took the wrong trail and got lost. He was not prepared with the physical things needed for survival at this time and while he had a fishing pole, that was it. Jared worried he was in big trouble for getting lost and felt a strong need to find his camp, so he kept moving. He knew they were camped in a group of trees, so he hiked up the mountain side a bit, so he could look down and try to spot the camp . He observed that there were seven areas with groups of trees , but he had no idea which group of trees he needed to head toward. Jared was suddenly filled with barely controllable fear and frustration . Soon after Jared took the wrong trail our family was notified and Jared's dad and brothers headed to the mountains. I headed for the computer and asked for prayers in his behalf. It was a long nerve racking day for us. Initially, we all felt that Jared would be found quickly, but as the hours sped by our deepest fears surfaced and concern grew. We were concerned for Jared's safety and worried about his comfort. We could only pray Jared would remember things he'd been taught in scouting about survival. My young son was lost on the side of a mountain alone . Our family wasn't quite sure what he knew about survival since we really don't camp out, so we were frightened. There were quite a group of people, including a lot of our family members , who immediately headed for the mountain when they heard about Jared. With so many of our family members and friends searching, we truly felt blessed. The mountain close to camp was searched thoroughly the rest of the day and that night. Jared told me that he heard them calling him, but when he yelled back they didn't hear him. He realized they'd have to be fairly close to hear him. Nonetheless, Jared now knew he was being looked for. Even knowing that he had others looking for him, Jared could not stay still. He was scared, but still determined to find his camp and scout troop. He remembered one of his scout leaders had once told the boys "all rivers lead to the lake." Remembering that advice, Jared started following a river downhill. He later told me "All rivers do not lead to the lake. The one I followed led me to a pond." He made sure as he traveled that he could always see the river and he kept going downhill following it. At one point of his difficult journey, he came across a momma moose and her calf, which terrified him. Jared is afraid of dogs and cats he isn't familiar with, so a moose terrorized him. He backed away from the moose and when he was far enough away he took off running. He prayed he wouldn't see any more wild animals, especially bears. As the sun was going down, my families stress level was rising. At one point his dad, Larry, and the other searches heard: "we have 'em". Everyone assumed that meant they'd found Jared. They later learned there had been a few other folks in the mountain separated from their groups and they'd found them , but not our Jared. Soon most of the search parties stopped for the night, at least in that area, due to darkness and falling temperatures. There was another group, however, consisting of an Uncle, two cousins and a brother that were in another area and they refused to stop. They were determined to find Jared and searched throughout the night in very cold temperatures. The temperature had dropped to 30 degrees and yet the group still searched; one of the cousins had a bout with mild hypothermia. This group of searchers also heard bears. Jared heard helicopters flying over head, but couldn't see them. Sadly, he discovered there wasn't a clearing he could find nearby that would allow them to see him. With cold reality, Jared knew he would be spending the night in the mountains alone, and his fear grew. At this point Jared began thinking hard about survival and remembered other things his scout leaders had taught him. He remembered you should dig a hole you could fit your body into while lying down. He started digging and laying in the hole to see if he would fit. He kept digging until he could fit nicely. He then covered himself with all the dirt and leaves that he could find. He was hunkered down for the night. He was still scared, so he continued praying that no bears would come. Amazingly no animals passed by him that night and he didn't even hear them. Obviously his prayers were heard and answered. While Jared was in his cold hole in the ground, our family continued praying and so did thousands of other folks. People rallied at our established control center to join the search the next morning. We couldn't believe the hundreds of people, mostly from the local community and some strangers, arriving on the mountain to help our family. It was an awesome sight and very humbling. Jared's survival situation is the toughest thing we've ever experienced as a family. As far as this mother is concerned, morning couldn't come soon enough. I wanted my son back safe and sound, but fear was eating at my stomach like a live animal. My only option and comfort was to pray and trust in God . I n God all things are possible. After a long and horrendous night, the sun finally peaked over the mountain and the search was once again organized. Search parties went out and the hunting continued. Just about an hour , or maybe an hour and a half , after the search started, we got news Jared was found. I couldn't believe it and refused to trust the report until it was confirmed again. Minutes later Jared was brought to the aid station by some young men who were camping on the mountain. They weren't even part of the search party, but had heard there was a lost scout and went looking for him. Jared had covered a lot of ground the day before, with rescue professional s estimating between 9 and 11 miles, but he'd come out exactly where the search and rescue folks hoped he would. He did everything right after taking the path he chose. I cannot describe the relief felt by each and every person, especially his family. It was truly the best feeling I have ever experienced, my son was safe! Today our family feels very blessed to have Jared with us. We are extremely grateful for wonderful scout leaders that teach boys survival skills. It was these skills he'd learned in scouting that kept him alive while in a life threatening survival situation. We also know God had a hand in my son surviving his emergency. Our family feels very strongly about being prepared in all areas of life for any kind of disaster. Mr. Benton's book has procedures and simple suggestions that we can all use to prepare for the next disaster . Our family has learned many things over the years about being prepared for natural disasters, but I am not sure if the time came we would remember everything. Having a book with all the reminders in it is a great idea. I like “Impending Disasters” and especially like the basic information we will need on hand to prepare for a natural disaster. The book isn't overwhelming at all and is simple to read. Mr. Benton has included some great suggestions everyone can do, without spending a fortune. Part of being prepared is being educated on how to prepare. This book will help you do that and much more. If our son hadn't been educated ahead of time, I am afraid the outcome would have been much different. 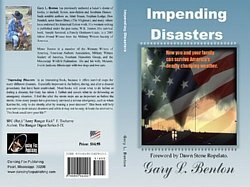 I recommend “Impending Disasters” for anyone who is interested in surviving the next natural disaster and as Gary says in the book, “there will be another disaster or terrorist attack; it's just a matter of time .” Shouldn't you and your family be prepared? Was $14.95 Now $9.99 plus shipping, but special ends on 31 January 2013. $9.99 (Softback Copy) plus $2.00 - U.S. shipping and handling! Canadian or overseas orders contact me before you place your order, additional fees will apply. This book could very well save your life and the lives of your loved ones. Learn to survival almost any natural disaster. See the video below.